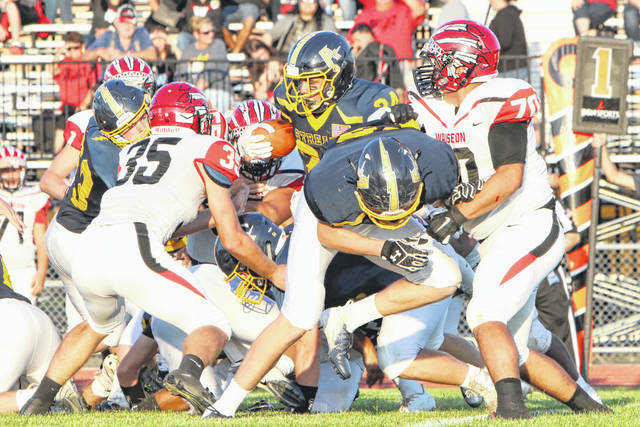 Joey Shema (35) and Trevor Rodriguez (70), both of Wauseon, surround Archbold tailback Noah Gomez in their matchup this season. Rodriguez and Shema each made special mention All-Ohio in Division IV. Fulton County football players garnered all-state honors on the teams selected by the Ohio Prep Sportswriters Association. Wauseon had two seniors make special mention All-Ohio in Division IV. Honored for the Indians were Trevor Rodriguez and Joey Shema. In Division V, Kasyn Schaffner of Archbold was selected second team All-Ohio on the defensive line. Delta had a player recognized in Division VI. Receiving the honor was Hunter Tresnan-Reighard who was named special mention.